Jude Dubuisson knows things he shouldn’t. He has the supernatural ability to find lost things, a gift passed down to him by the father he has never known—a father who was more than human. But so much was lost during Hurricane Katrina that it played havoc with Jude’s magic, leaving him overwhelmed and cursed. Jude has been lying low since the waters receded, hiding from his own power, his divine former employer, and a debt owed to the fortune god of New Orleans. When the fortune god is murdered, Jude is drawn back into a world full of magic, monsters, and miracles—and a deep conspiracy that threatens the city’s soul. 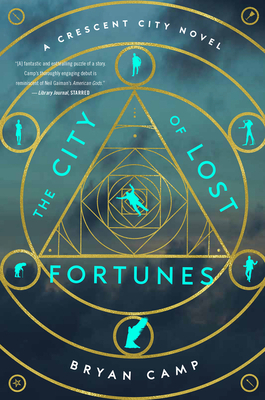 As Jude investigates the fortune god’s death before the killer can strike again, he discovers what his talent for lost things has always been trying to show him: what it means to be his father’s son. BRYAN CAMP is a graduate of the Clarion West Writers’ Workshop and the University of New Orleans’s MFA program. He started his first novel, The City of Lost Fortunes, in the back seat of his parents’ car as they evacuated the Crescent City during Hurricane Katrina.